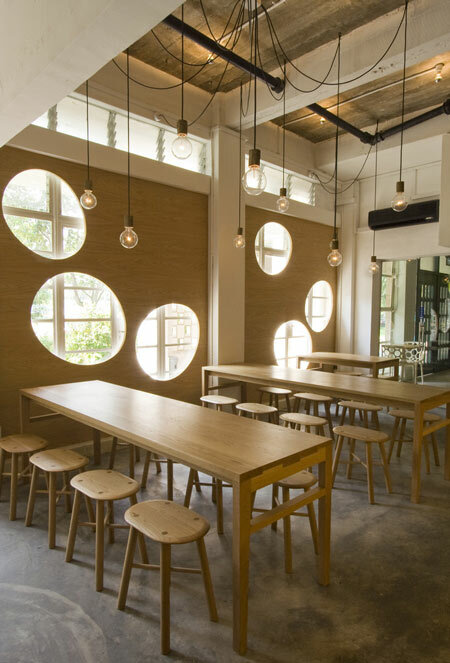 Design collective Outofstock have completed the interiors for a restaurant in Singapore, where the windows are covered by wooden panels with egg-shaped cutouts. 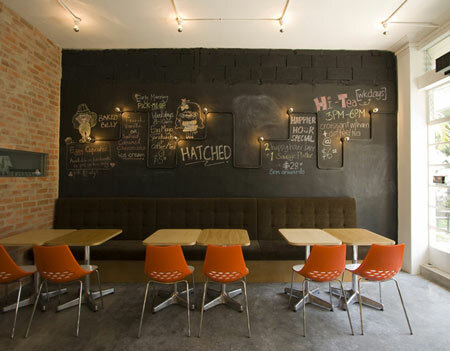 Called Hatched, the restaurant is divided into two dining areas, a central one with long communal tables and individual tables in front of a large blackboard. 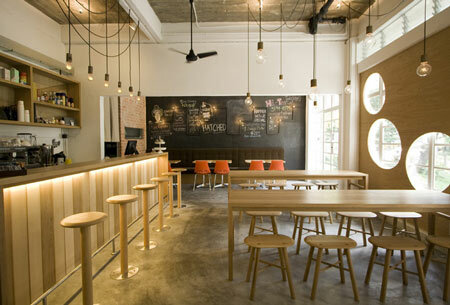 Wood features throughout the space, with a wooden bar facade made of three different types of wood and matching stools. 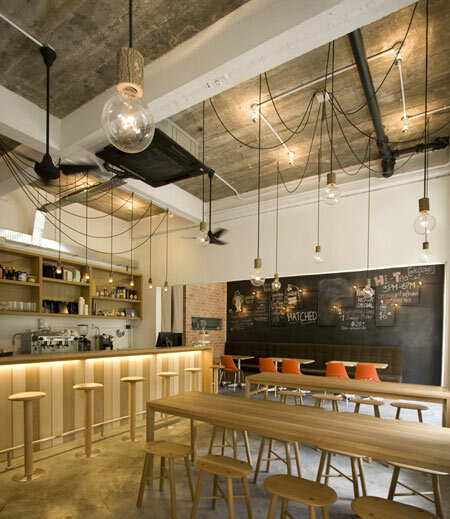 The space is located in an old student dormitory next to a university campus and can accommodate up to 38 diners. 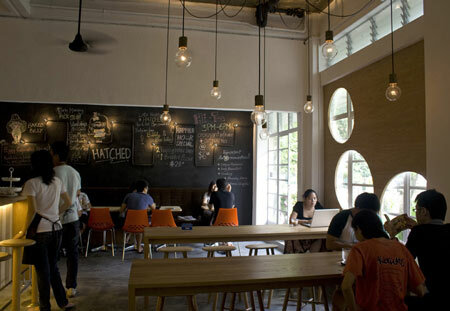 Outofstock recently completed the interior design of Hatched, a casual restaurant in Singapore that serves breakfast all-day. 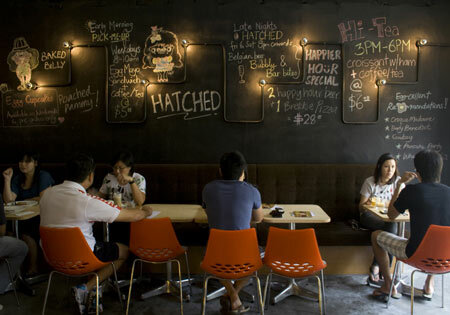 Located in a fifty-year old student dormitory building next to the National University of Singapore’s Law Campus, Hatched serves up a curious array of egg-inspired dishes and desserts catering to a youthful target audience. 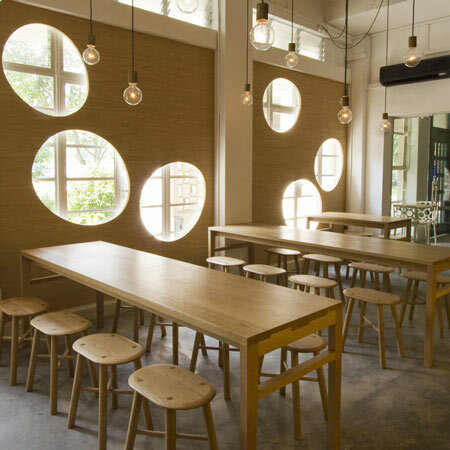 The intent behind the design was to create a cozy and fun dining atmosphere which identifies with the restaurant’s theme of breakfast and eggs. 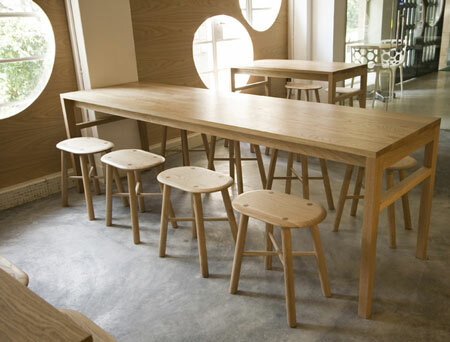 Another challenge was to accommodate up to 38 diners and a kitchen into the 58 square-metre space. 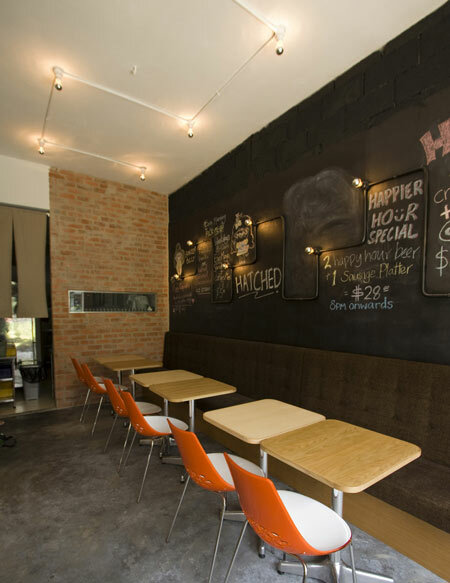 We divided the dining areas into two parts – a central dining area which features long communal dining tables reminiscent of summer camps, and a fun-wall area where customers dine in front of a large blackboard-painted wall which allows the guests and staff to doodle or leave messages. 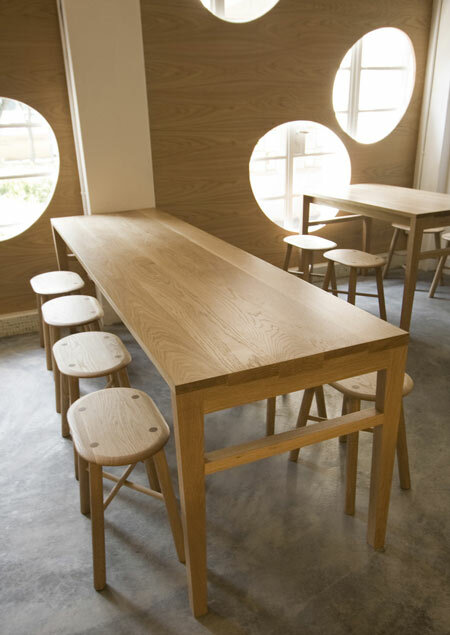 A long bar counter features a façade consisting of oak, maple and beech veneers and accompanying bar stools also feature the same three solid woods. 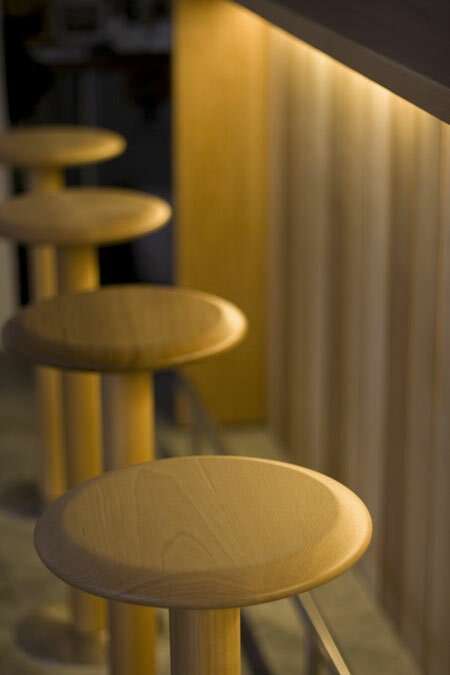 The play with natural light is a key ingredient which characterises the space and we designed oak veneered panels with egg-shaped cut outs to filter light in from street-facing glass windows. These “egg panels” also serve as an identifiable frontage for the restaurant. 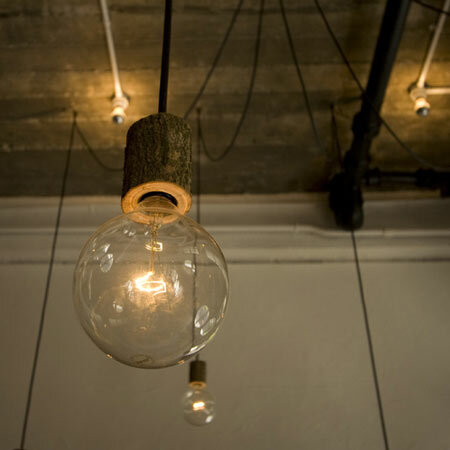 The use of guava tree branch off-cuts sleeved over bulb holders adds a tinge of farmhouse charm and all the exposed light bulbs are connected to dimmers so as to regulate the brightness needed during the day and night. 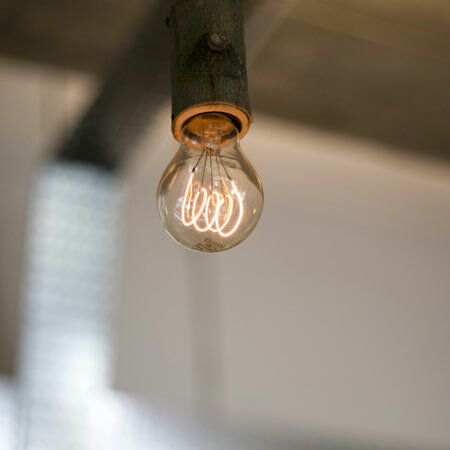 Although there has been much phasing-out efforts of incandescent light bulbs in recent years, the rich, warm glow and character of near obsolete carbon filament bulbs we found at a specialty bulb supplier was difficult to resist. 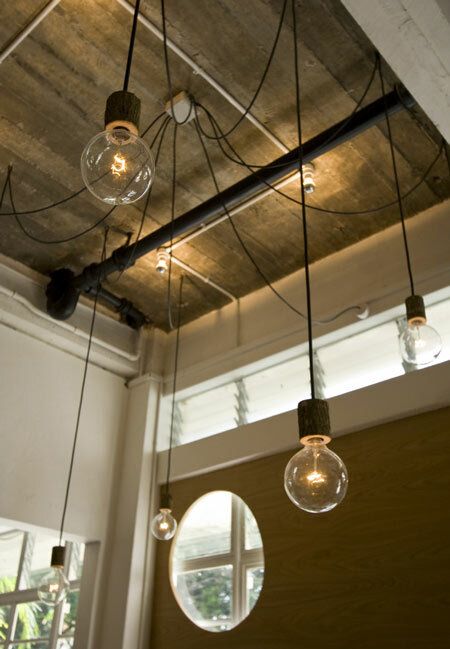 We chose to expose the original concrete ceiling of this historical building and highlighted its textural qualities with lighting. The design collective was born out of a fortuitous meeting in Stockholm, hence the name Outofstock. Gabriel Tan and Wendy Chua from Singapore, Sebastián Alberdi from Spain and Gustavo Maggio from Argentina met at Electrolux Design Lab 2005. They began their collaboration in 2006 and what started out as a creative experiment eventually became a long-term design partnership and the studio now works across furniture and interior design that counts Ligne Roset, Bolia, Foundry and FiftyThree as its clients. As a team comprised of culturally diverse individuals, Outofstock’s creative energy derives from the differences of its members and not from any fixed formulas. What binds them is the vision of creating designs with a formal coherence that are relevant to the user. Outofstock is a registered business in Singapore with studio locations in Singapore, Barcelona and Buenos Aires. egg-shaped cutouts?? that idea is so adorable!!! Hi there. Welcome to my blog. My name is Nari Kang from Korea. This is my blog, nari's archive. I am collecting articles related to my interests and uploading my photos I take, books I read, movies I watched, notions I think and EVERYTHING!! !